Ok let’s be honest – a few weeks into January and most of our New Year resolutions have already fallen by the wayside – destroyed by all the excesses that make summer so much fun! And while it’s fantastic to want a fitter, more fabulous you, the time has come to devote our energies to fixing the environment instead. The health of the ocean is declining and even if you don’t live within coo-ee of the coastline, chances are this will still impact on you at some stage. Its estimated more than one third of the world’s population depends on seafood for 20% of their animal protein. And while issues like overfishing and global warming need to be tackled on a large scale, there are many simple steps we can take to improve the quality of our waterways and the lives of their inhabitants – not just for us but for generations to come. 3. It’s in the bag! 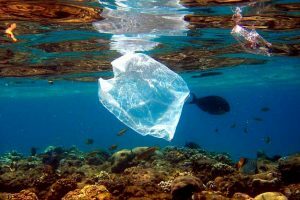 The problem of single use plastic bags is well documented to the point that several states including Queensland are now planning to ban their use. And while it does take a little more effort to BYO, sea turtles of the world will thank you! Unfortunately, your average green turtle cannot distinguish between floating flimsy plastic and their favourite food – sea jellies. And with the added bonus of being less likely to break than the plastic imposters, reusable bags are a great way to show you care! This entry was posted in Uncategorized on January 18, 2018 by oceanlifeeducation.